WE. ARE. SO. READY. FOR. HALLOWEEN. Yea, we know that we’re 21 and that Halloween is generally intended for the under-13 crowd, but we adhere to the fact that it’s an awesome holiday. The dressing up aside (and don’t get us wrong, we are huge fans of a good costume), Halloween is the perfect kickoff to the Fall/Holiday season! Think about it: one second you’re dressing up for candy, then it’s pumpkin spice season, all the sudden there’s a chill in the air, leaves start to fall (or so we hear- this one doesn’t really happen in Florida), you go home for Thanksgiving, and then BAM! Christmastime! 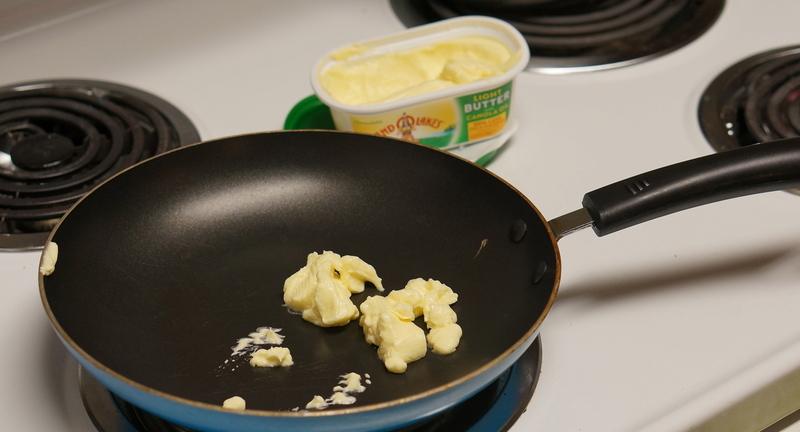 First, put your butter into a medium sauce pan and melt it over low heat. While you’re waiting for the butter to melt is a good time to get your Tootsie Rolls ready. Unwrap them and cut them in half. 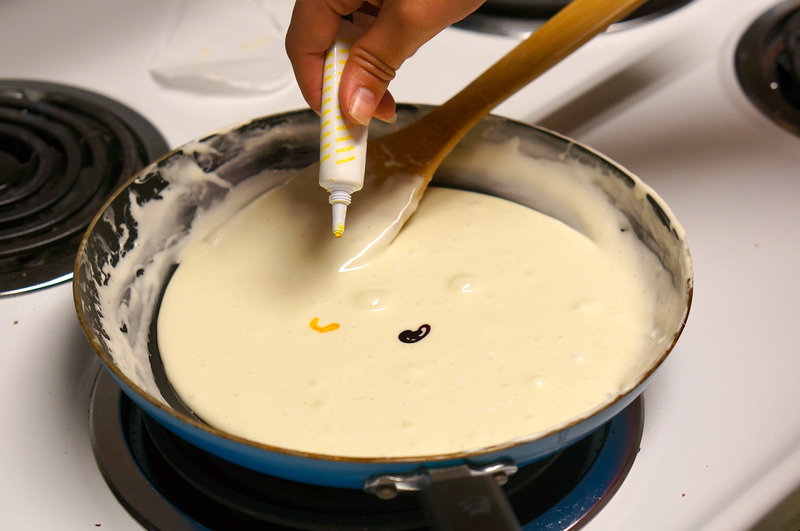 Once your butter is melted, pour your marshmallows into your saucepan. Stir constantly over low heat until the marshmallows are completely melted. Keeping your marshmallows over a low heat, add your food coloring. Stir until well blended. 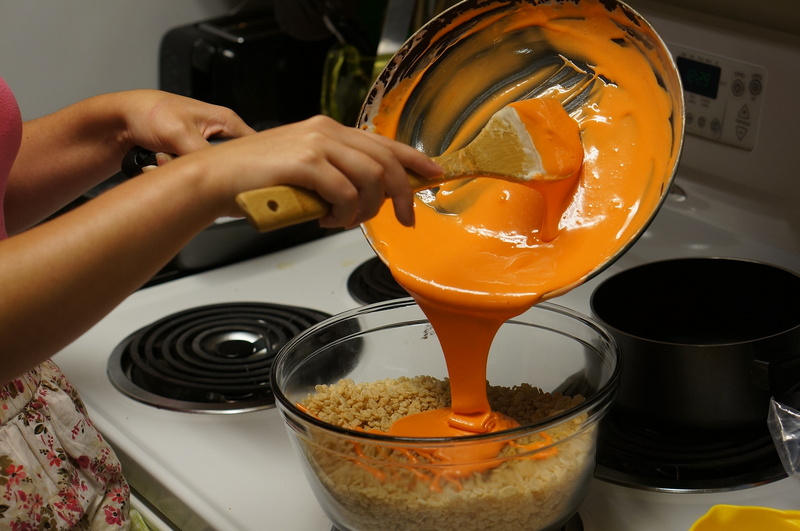 Add more food coloring until you are happy with how orange your marshmallow is. 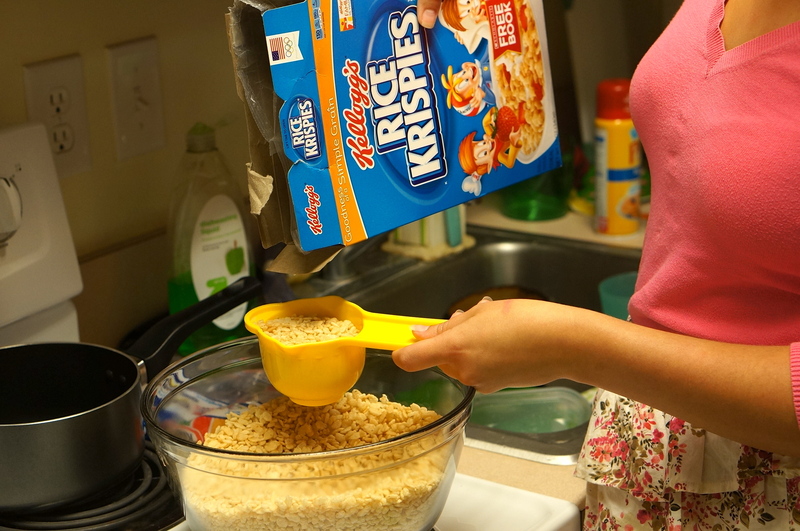 Pour your Rice Krispies into a large mixing bowl. 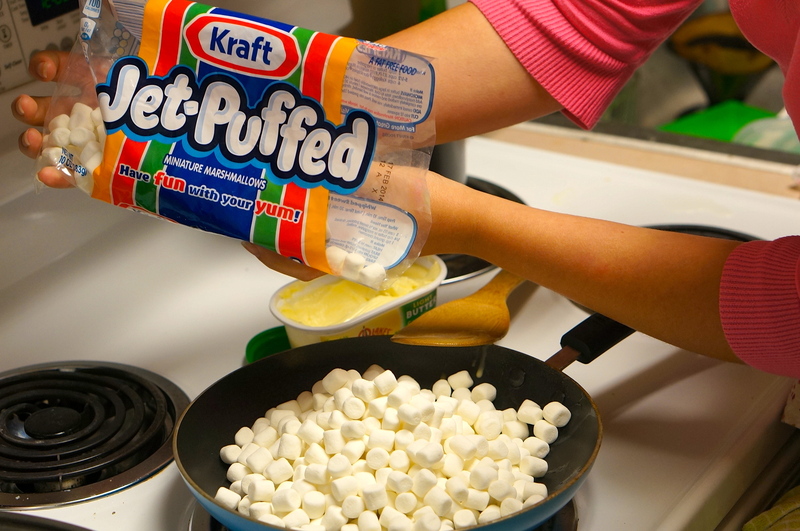 Add your melted marshmallow mixture. 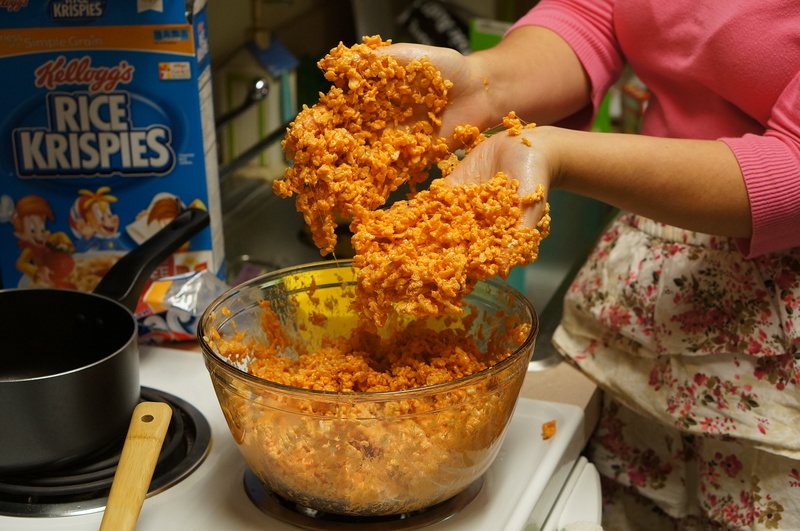 You can attempt to mix your Rice Krispies and marshmallow mixture with a spoon, but we decided it would be easier to get our hands dirty. 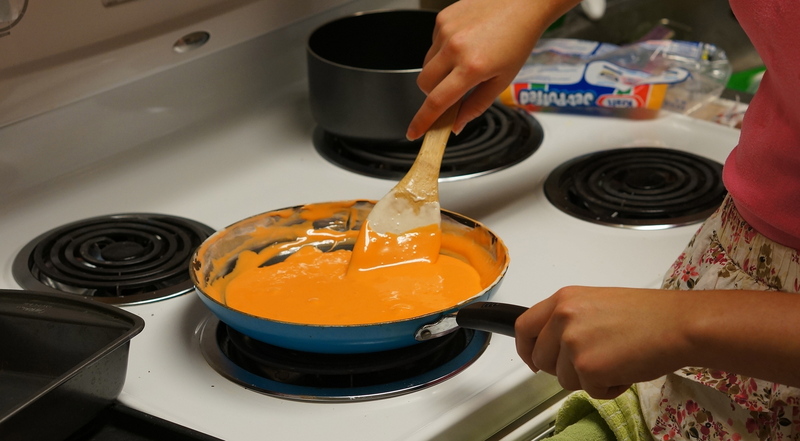 If you choose this method, be very careful not to burn yourself with your melted marshmallow mixture! 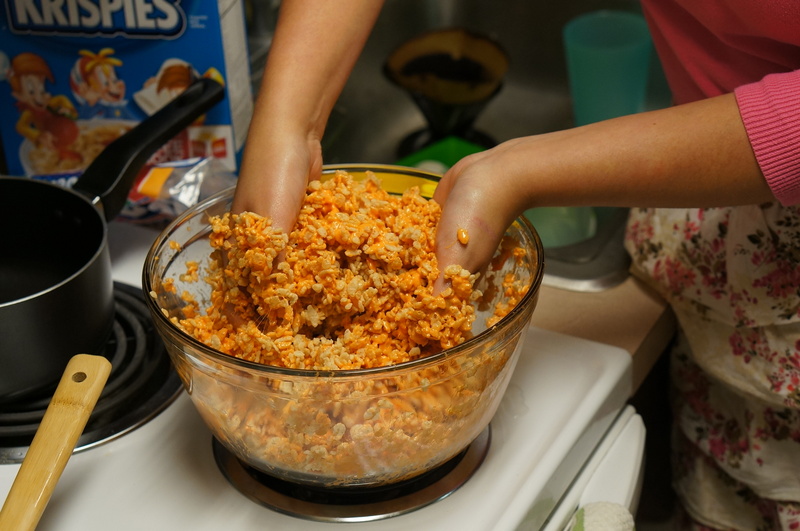 Once your Rice Krispies and marshmallows are thoroughly mixed, get it off your hands as best as you can and wash up. Now it’s time to form your pumpkins! We found it was easiest to do this using Pam cooking spray. After washing and drying your hands, give them a generous spray of Pam and rub them together. Seriously coat yourself with the stuff. 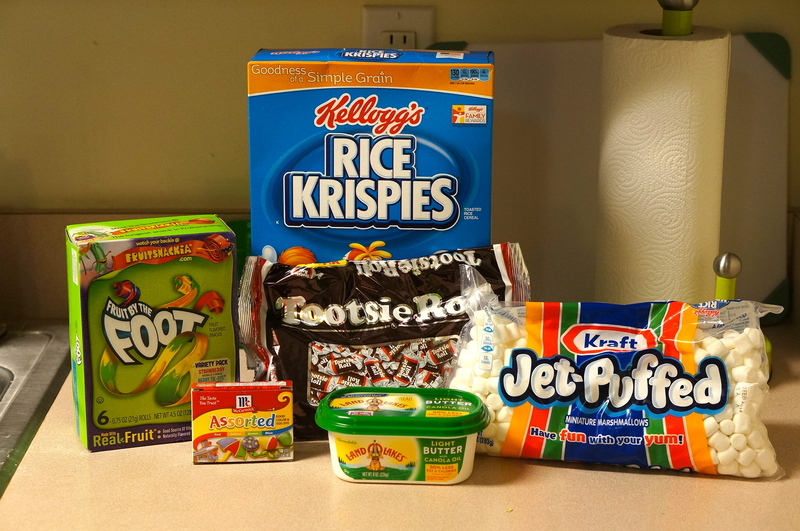 Then you should be able to form Rice Krispie treat balls without the cereal sticking to you too much. We found it worked best if we washed our hands and reapplied Pam every fourth ball or so. 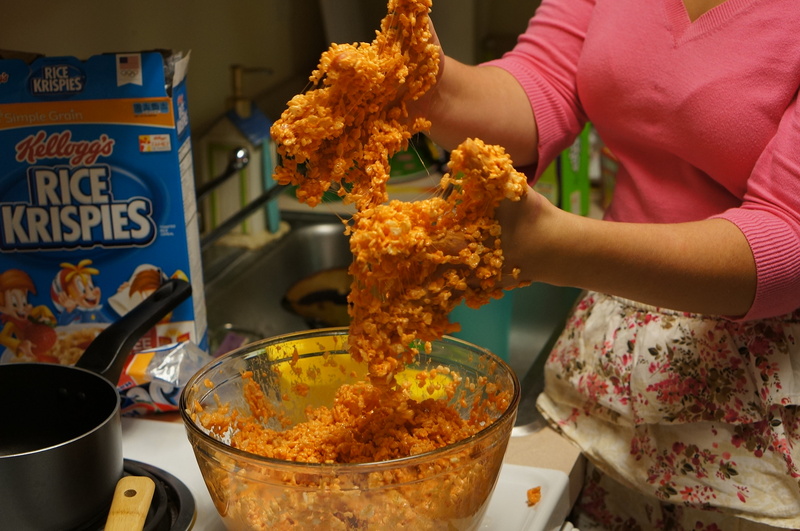 We ended up yielding 20 pumpkins, slightly smaller than our fist, from this recipe. 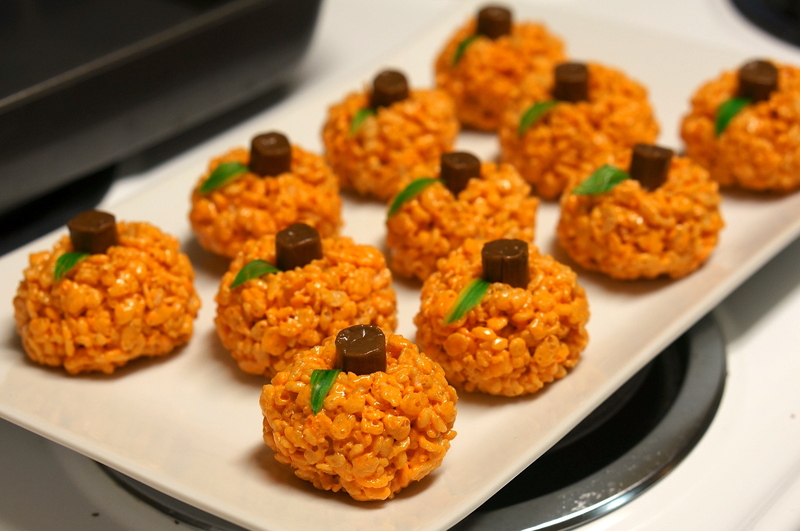 Once you’ve formed your Rice Krispie treat pumpkins, it’s time to make your leaves. 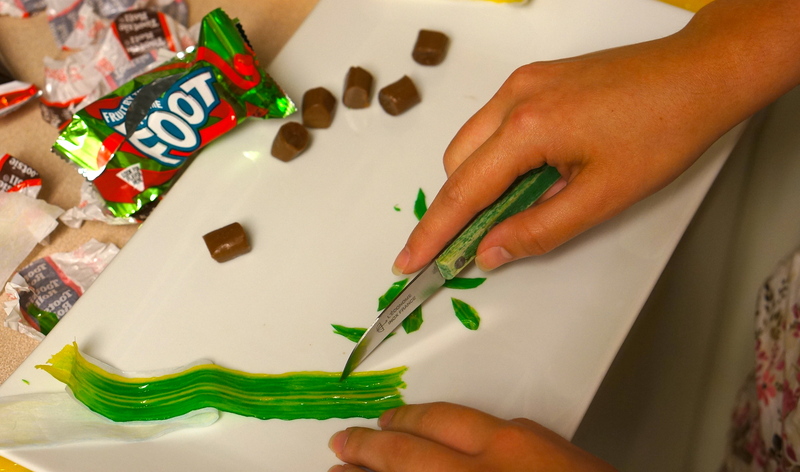 Unwrap a green fruit roll-up and cut out little leaf shapes. 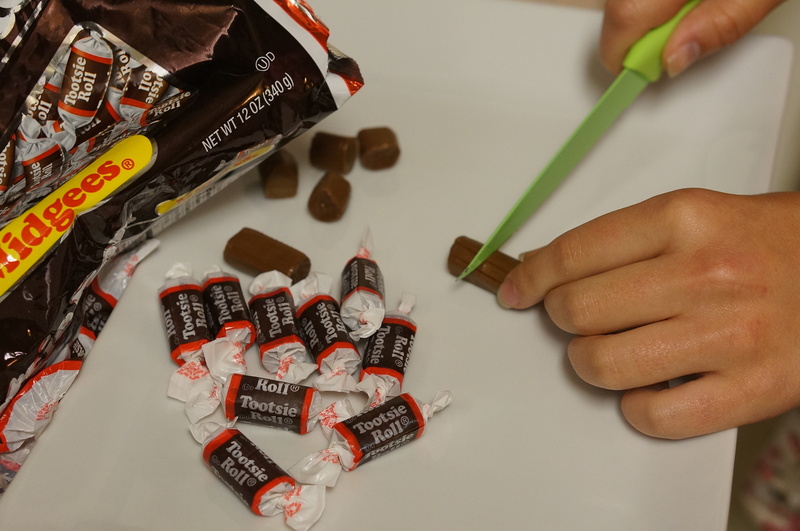 Squish a Tootsie Roll half into the top of each pumpkin to create your stem. 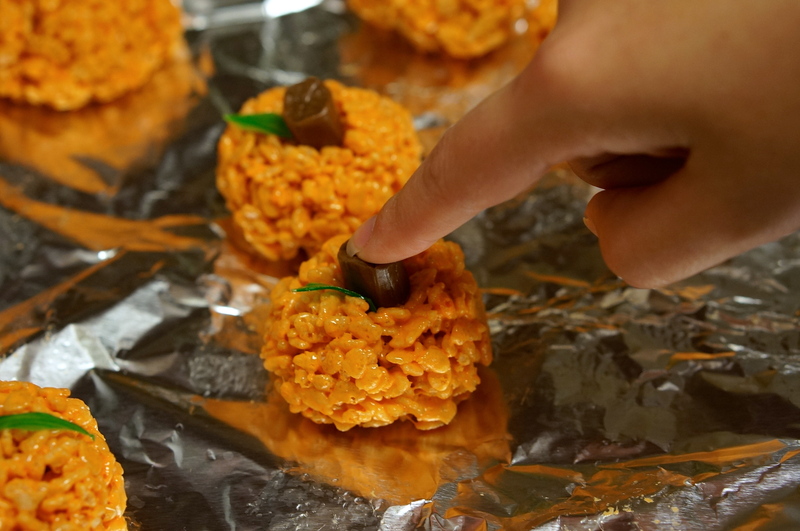 You may need to roll the pumpkin ball a little bit afterwards if your Tootsie Roll deforms it too much. Then place a leaf on your pumpkin coming out of the stem and you’re good to go! We love this shenanigan! It worked perfectly, tasted delicious and was the particular brand of cute that we adore! With this we feel ready to move into the fall season and the Halloween spirit. Once you’ve made this little guys, might we suggest grabbing a bag of candy corn and settling in with It’s the Great Pumpkin, Charlie Brown or Hocus Pocus? Be sure to keep on the lookout for more Halloween-themed posts coming your way! 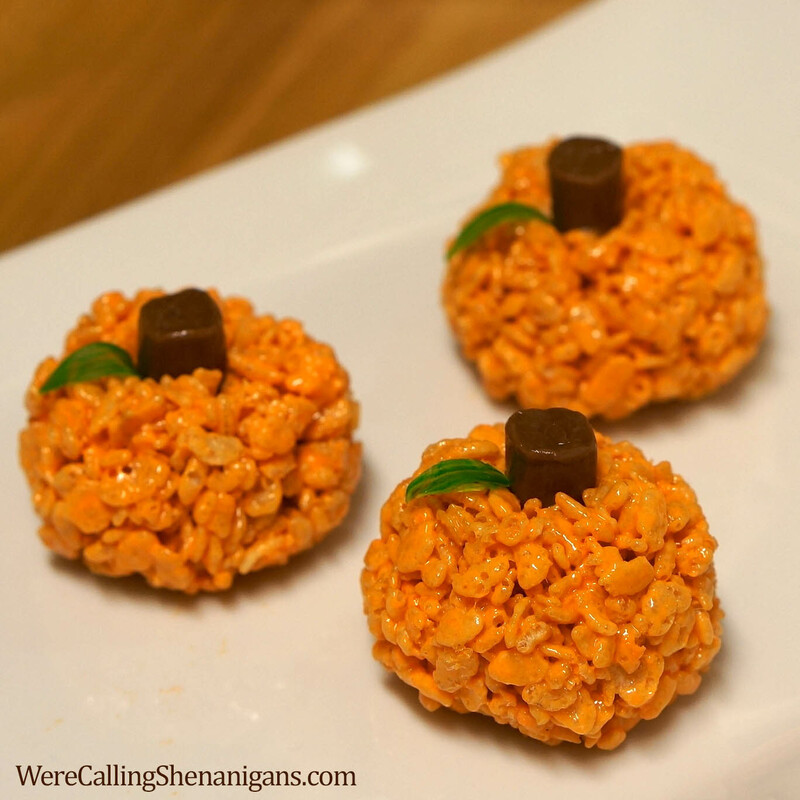 In the meantime, give one of our other Fall Shenanigans a try! These are adorable ! How fun and you can put faces on them with cookie icing!! The Kowalsky family will be making these for Halloween! Yes, your cousins, Kaela & Kendall. We will let you know the outcome. These are TOTALLY adorable, I love them! !